First of all it has a great recipe for Cook-a-leek that I have cooked at two Larp events now. My only problem with that recipe is that if you want it to taste good the cooking time should be quite a lot longer than stated – but that kind of thing is hard to big right about at events since you don’t tend to have a watch. Otherwise the introduction is really good and has some really interesting thoughts on what viking cook would have been like as well as on how we know what we know and the huge amounts we don’t know. The recipes are all imagings of modern people since we have no recipes from the period in the region at all. What we do have is archaeological evidence and we know what they ate later in Denmark. The tone is informal and the author isn’t overly concerned by trying to get everything 100% authentic which I personally like. It’s about cooking for modern people, not history snobbery. 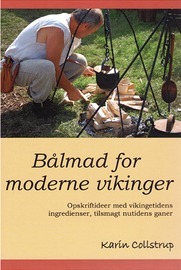 I do think this is a rather useful book for both reenactment events and for larping – as in all likelihood people will like and eat what you cook for them. However the reliance on food stuff that was clearly not in abundance (as the author note herself) is a bit annoying. Some dishes uses liters of cream and pounds of bacon. I hope to try out other recipes and report on them here on the site. I need to remember to photograph my food at events.